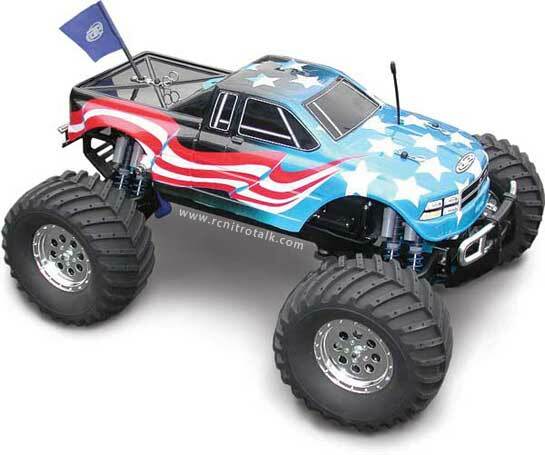 Chassis: The Team Associated Monster GT is equipped with an extra-long, channeled chassis machined from a one piece of extruded aluminum, which extends the full length of the Associated Monster GT to form an extremely rigid and tough chassis. Molded plastic side plates are attached to the chassis to form a tub which are meant to add additional protection to what’s under the body as well as provide room for all the electronics and fuel tank. The Monster GT’s chassis even sports a small skidplate molded into the right side plate which protects the steering servo from rocks and debris. Suspension: To help reduce the Associated Monster GT’s part count, the front and rear suspension a-arms, pivot-ball carriers, body mounts, shock towers and shocks are all identical. The Associated Monster GT uses plastic-body, oil-filled shocks which also have mock reservoirs for extra style. The Monster GT shock tower and suspension a-arms have several shock-mounting positions to broaden tuning capabilities for any kind of terrain. The Associated Monster GT also uses standard 14mm hex hubs which let you bolt on wheels designed for the Traxxas T-Maxx and HPI Savage 21. 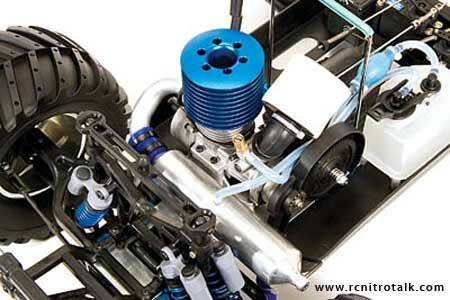 Engine: Team Associated decided to power the Associated Monster GT with a Team Associated Pro-21 engine. The Associated Monster GT Pro-21 features Team Associated’s patented “Dual-Start System” that allows you to pull-start the engine like normal, as well as crank the engine with a hex shaft which can be chucked in a cordless drill (similar to a roto-start). The Monster GT Pro-21 engine also features a dual-needle slide carb, ABC piston and sleeve construction, a bushed connecting rod, a 9-fin machined-aluminum cooling head and a dual-element, high-volume air filter. Transmission: The Associated Monster GT features a shaft-drive 4WD transmission which is mounted transversely on the chassis. 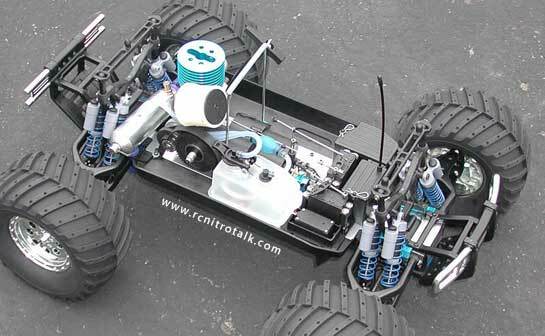 Most other monster trucks have their transmissions mounted in-line. A bevel gear on the spur gear shaft is mated with a bevel gear inside the transmission, and tha’s how the transmission receives power from the engine to the transmission. The Monster GT transmission also features an adjustable 2-speed and a servo-actuated reverse that are activated by a third channel on the radio. The Associated Monster GT is also equipped with an adjustable slipper clutch which provides protection to the transmission internal parts and it can be used as a traction-control device to limit wheelspin. Radio Box: The receiver and battery pack are in separate molded boxes with lids secured by body clips for easy access. The molded electronics box can also be quickly removed by just a few screws. This allows the Associated Monster GT to be quickly and easily cleaned without the worries of the electronics in the way. All metal CVA Center Driveshafts. Over 4 Inches of ground clearance. Adjustable Toe-In, Camber and Ride Height. Uses industry standard sized wheels. Huge 6 5/8″ diameter all-terrain tires. Unique pivoting body mount system. Three channel radio gear fully installed. Chrome-plated bumpers front and rear.